Seasonal squash provides more than a day's worth of vitamin A and about half the daily recommended vitamin C. Geneva Lakes has your squash and The Cheese People have a fine selection of cheese. Instead of olive oil, try a flavored grapeseed oil from Wild Tree. This is a great side dish to the roasts, chops and steak available from our meat vendors. Don’t forget the wine from Glunz Family Winery. 2. Steam butternut squash, covered, 10 minutes or until tender. 3. Place bread in a food processor, and pulse 12 times or until coarse crumbs measure 1/2 cup. Transfer to a small bowl; add 2 teaspoons oil, and toss with a fork to combine. 4. Heat remaining 2 teaspoons oil in a large nonstick skillet over medium-high heat. Add sliced onion to pan; saute 5 minutes or until tender, stirring occasionally. Transfer the onion mixture to a large bowl. Add butternut squash, chopped sage, salt, and black pepper to bowl, and toss gently to combine. 5. Spoon squash mixture into an 11 x 7–inch baking dish coated with cooking spray. Bake at 400° for 20 minutes. 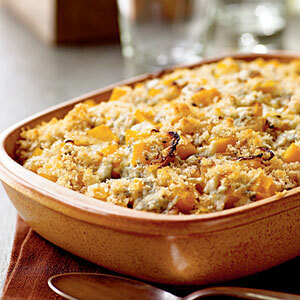 Sprinkle crumbled blue cheese evenly over squash mixture, and sprinkle evenly with breadcrumb mixture. Bake an additional 10 minutes or until the cheese is melted and crumbs are golden brown.